On July 29, 1794, Mother Bethel African Methodist Episcopal (AME) Church opened in Philadelphia, Pennsylvania, making it the oldest church owned by African Americans. Richard Allen, a former slave who bought his freedom after accepting the Methodist faith, founded the church. Allen, along with friend Absalom Jones, opened the separate church after whites at St. George’s Methodist Church attempted to force the African Americans to relocate to a racially segregated balcony during a worship service. This affront caused Allen to initiate his plan to begin an African American religious institution in the city. Opening its doors in 1794, Mother Bethel served the spiritual needs of the wider African American population. By referring to the denomination as “African Methodist Episcopal,” Allen welcomed a wider number of the community into the fold. 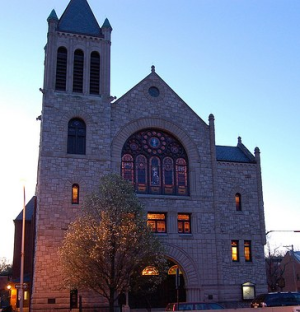 Mother Bethel AME Church is symbolic of the history of African Americans voluntarily separating from racist institutions to serve the needs of the community. The founder of Mother Bethel AME Church, Richard Allen, was born a slave in Philadelphia, on February 14, 1760. Sold to an owner in Delaware, Allen began attending the Methodist Church. Allen was a hard worker and eventually earned enough money on the side to purchase his freedom in 1786 for the sum of $2000. A free man, Richard Allen returned to Philadelphia that year. He soon received permission to preach the 5am church service at St. George’s Methodist Church. Some whites complained, requesting Allen’s removal from the pulpit. Recognizing the need for an institution that African Americans could call their own, Allen and his close friend Absalom Jones began the Free African Society, a mutual aid society to provide burial services and financial assistance for the ill, in April of 1787. Allen and Jones ensured that the Free African Society provided aid to all African Americans, regardless of religious affiliation. This spirit of self-help would provide the impetus to organize an African American controlled religious institution. The moment that Allen decided to sever ties with St. George’s Methodist Episcopal Church occurred on a Sunday morning in November of 1787. The large number of African American congregants angered enough whites that church authorities established a pattern of racial segregation. African Americans now had to worship from a balcony, rather than their usual pews. On the fateful morning, Richard Allen and Absalom Jones kneeled praying at their usual front pew. An usher tapped Allen on the shoulder and demanded the men relocate to the assigned area for African Americans. Allen asked that the ushers, at the very least, allow them to complete the prayer. The ushers then physically removed the men from the pews as the prayer continued. Rather than accept the insult of racial segregation, Allen and his group walked out of St. George’s, never to return. Allen, William Grey, Absalom Jones and William Wilcher began searching for land to build a new, independent church. They received funding from the African American community, along with aid from such notable citizens as President George Washington. Mother Bethel Methodist opened its doors to parishioners on July 29, 1794, with Bishop Francis Ashbury leading the dedication service. The white-led Methodist General Conference and leaders at St. George’s refused to allow the African Americans to worship in peace. Ministers from St. George’s would at times arrive unannounced at Mother Bethel, declaring the church under their authority. Finally, in 1816, the Pennsylvania Supreme Court declared the Mother Bethel African Methodist Episcopal Church independent of the Methodist General Conference. The AME Church is thus the first African American religious denomination in American history, and Mother Bethel was the first AME congregation.